Indonesia is one of the biggest steam coal exporters in the world especially contributed by the export from Kalimantan that contributes 48% of total coal resources in Indonesia and 45% of the resources are still available in South Sumatra. However, of all the resources, only 5% are made available for export and the bottleneck is on the transportation. 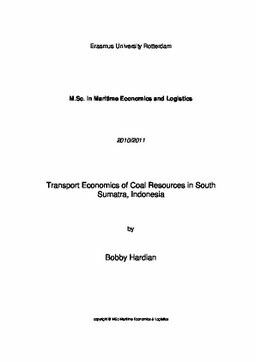 Existing transportation system had limitation capacity due to enormous increase for Indonesia‟s coal demand.Several scenarios of transport method are discussed in the hope to increase the supply capacity for domestic needs and export, with respect to South Sumatran geographical condition. If the coal must find the least-cost solution, the transportation of coal from South Sumatra, for example to China, appears to be economical; supported by the Musi River which is nearby to the seaport.